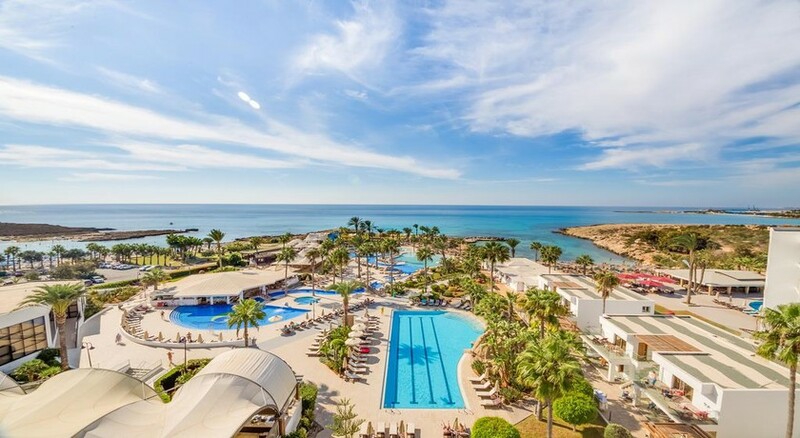 Surrounded by fine white sandy beach and shallow, turquoise waters, Adams Beach Hotel boasts a spectacular location on the picturesque Nissi Bay in Ayia Napa, Cyprus. 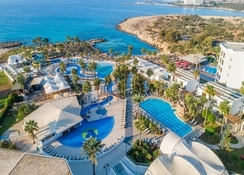 With its enviable location, superb amenities, great service and Cypriot hospitality, this 5-star luxury hotel and its adults-only Deluxe wing is an ideal destination for a beach holiday. The seafront hotel boasts its private beach and a secluded cove, giving you the perfect opportunity to hit the crystal-clear waters of the Med. Adams Beach Hotel is set amid palm trees and lush gardens, as well as a swimming pool complex that comes with lazy river, fountains, Jacuzzis, water cascades and even water slides. The well-decorated modern rooms and suites offer amazing views of the sea, while for dining options, guests can choose from the on-site restaurants serving a variety of cuisines from International, Fusion, Japanese and Oriental. You can also enjoy a cocktail at the piano bar or watch a performance at the animation area near the pool bar. Else, relax with a soothing massage at the hotel’s spa. The younger guests have plenty of entertainment, from kids’ clubs to daytime activities and evening events. The Waterworld waterpark is also close by. 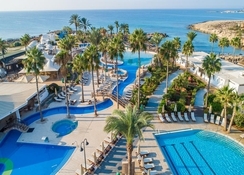 The resort is situated around 2.5 km from the Ayia Napa centre and just a 5-minute walk to the nearest shops and restaurants, so you’re never far from the hustle and bustle of town. Whether you fancy a family holiday or a vacation with your partner, Adams Beach Hotel ticks all of the boxes. 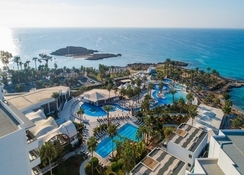 Adams Beach Hotel is located directly on the beach in Nissi Bay. The hotel’s private beach is just a few minutes’ walk away. A coastal path runs from the property to Ayia Napa town centre or in the other direction towards Makronisos and Ayia Thekla (popular for its stone carved underground church). The Ayia Napa centre is 3km from the hotel, while there are a lot of shops and restaurants around 100 metres away. The hotel is also in proximity to many cultural attractions such as Ayia Napa Monastery, 'Thalassa' Marine Museum, WaterWorld Waterpark and the picturesque harbour from where you can take boat trips to sea caves and around Cape Greco. The Larnaca Airport is 45km from the hotel. Spread over five floors, guest rooms at Adams Beach Hotel are housed in the main building, bungalows and the Deluxe wing (only 16-years plus allowed). There are 435 rooms, out of which 348 are in the main Adams Beach Hotel and 87 rooms are located in the Adams Beach Hotel Deluxe Wing located in a separate building adjacent to the main hotel. 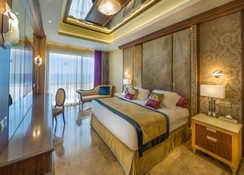 The rooms are categorised into Classic Rooms, Superior Rooms, Deluxe Sea View Rooms, Junior Suites, Queen Suites, Honeymoon Suites, Ambassador Suites, King Suites and Presidential Suite. There are also specially designed rooms for disabled guests. The rooms boast stylish interiors and feature air conditioning, balcony, telephone, satellite television, coffee table with chairs, mini bar, safe and Wi-Fi connectivity. The en-suite bathrooms are equipped with bath/shower, slippers, hairdryer, shaving mirror and bath amenities. The honeymoon suite features a Jacuzzi and chaise lounge, while some of the Super Deluxe Rooms have a private pool and terrace. The adults-only Deluxe wing feature rooms with balconies that offer views of the sea or pool. Some rooms have sun loungers in the balcony and private pools, too. 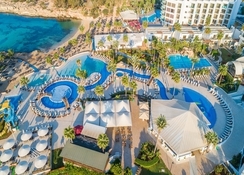 The hotel’s main restaurant – the adults-only Atlantis Restaurant - is located in the Deluxe wing and offers buffet breakfast and dinner for the guests staying there as well as those staying in Honeymoon Suites, Ambassador Suites, King Suites and Presidential Suite of the main hotel. On the rooftop is the fusion cuisine-oriented Glasshouse Lounge Restaurant that overlooks Nissi and Macronissos bays. The a la carte Lucullus Restaurant serves local and international cuisines, while Vala Beach Tavern offers fresh fish and snacks. For breakfast buffet, head to Les Jardin or Dionysos Restaurant in the garden, which also has an a la carte menu. The beachfront Socci Sushi Bar serves sushi, Japanese food and a selection of wines and cocktails. You can also enjoy drinks by the pool at the Vitaminas Pool Bar, but if you're a sports lover, watch live sports with drinks and snacks at Victory Pub. The Valentines Piano Bar by the lobby is a place for evening entertainment with piano and drinks. Adams Beach Hotel has a number of sports, leisure and recreation options to keep you entertained on your holiday. Guests can lounge on the hotel’s private beach or the cove. There are five outdoor pools, one indoor pool and a kids’ pool. The swimming pool complex also has a lap and leisure pool, two Jacuzzis, lazy river, water features and water slides. The hotel has a spa and wellness centre that offers steam bath, sauna and massage rooms to relax your body and mind. Sports lovers can enjoy tennis, beach volley ball and an indoor games rooms with billiards and table tennis. Children can take part in the kids’ club that offers activities like karaoke, crazy show, darts, face painting and games. There is a kids’ playground, children’s pool, waterslides and entertainment shows. Dance, magic and live music and singing shows are also organised by the hotel to entertain the guests. The Vitaminas Pool Bar hosts evening entertainment and piano music on most nights.